Tommy wants to date one of these men. No, the other one. No, the other one. No, the other one. Why is he Tommy’s Soccer Valentine? 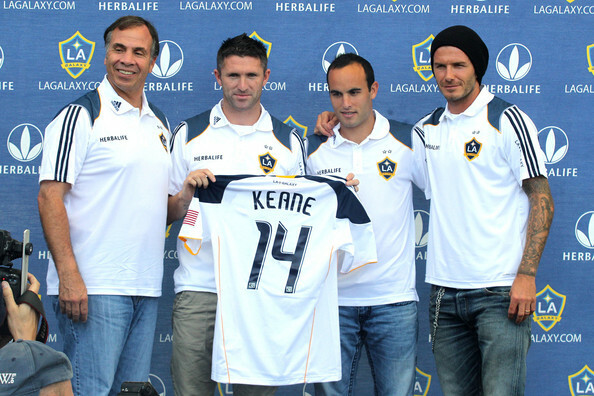 If the man can turn around the dysfunctional side that was the 2007/2008 LA Galaxy into arguably the best side ever in the league, imagine what he could do with a fixer-upper relationship! On the plus side, our evening will be quite pricey by American standards. Brucie – as he likes to be called, erm, by me – always seems to have ample cash on hand. “Allocation money,” he calls it. Whatever. You don’t have to tell me where you got it from or what you do on the side, Brucie. It’s not like I’m going to stop you from spending it on me. Why is he Jon’s Soccer Valentine? He’s cute, but he’s not my type, really. I’m more into coaches than players if you get my drift. But I love his candor, and the fact that he’s publicly matured before our eyes as soccer fans. I like that he doesn’t let all the criticism get to him and cares more about winning than answering his doubters. He’s in the middle of everything good that happens for whatever team he’s playing for, and that’s the sign of a quality player. And his leadership qualities keep improving — which means he’ll continue to matter to US fans like me for years to come. What would their Soccer Valentine date be? My ideal date with Landon would be a light, healthy meal (I can’t imagine him eating fried chicken or anything), followed by him teaching me how to cross with my left foot and how to trap long balls in tight spaces. Then we’d hold hands and watch replays of his best games while I told him how awesome he is, and how even in 2006 when everyone hated him, I was defending him in arguments even though it was getting difficult to do so. And I’d thank him for vindicating me in 2010 with a great World Cup performance. Then he’d go home early cause he has training in the morning, and he’d think of how I’ve inspired him to score a hat trick in the next game. Galaxy Re-Acquire Juninho, Form Voltron, Defend Universe? The offseason loss of creative midfielder Juninho was supposed to be a stake in the heart of LA Galaxy’s hopes of an MLS Cup repeat. The 23-year-old Brazilian’s loan was not extended by his parent club, Sao Paulo, as they wished to bring his maturing talents back home, going so far as to lock him in to a new 3-year contract. Galaxy began seeking out and acquiring several hopeful replacements, most promising amongst them fellow Brazilian Marcelo Sarvas and former Union man Kyle Nakazawa. Additionally, after a series of below-the-radar moves, Los Angeles announced over the weekend that they had… re-acquired Juninho on loan. The best man to fill a set of empty shoes is the same man who once wore them, it turns out, and Galaxy have gone from finding an acceptable replacement to having a set of midfield options unrivaled in the league. And when you add in the return of David Beckham and last week’s re-acquisition of former Galaxy striker and Golden Boot finalist Edson Buddle, you have to ask yourself: Is this the official start of the most potent MLS strike force… ever? If there is one thing many of the MLS Original clubs have in common, it is a history of kit design with little continuity and even less tradition. Los Angeles shares the top spot on this unfortunate list – alongside Kansas City – with a radical departure in design coming every year or two since their inception. But the beginning of the Bechkam era (MLS 2.0) coincided with a league-wide push for brand identity and as a result, in the years since, the casual fan can identify the teams around the league using only the clues provided by a color swatch. And as far as brand identity goes, Los Angeles Galaxy has led the way. Their all-white home kit with accents of blue and gold is not only recognized by casual soccer fans the world over, but by American soccerphobes as well, an arguably bigger achievement. On top of that, the Galaxy’s #23 jersey is one of the most-sold jerseys in the world. In any sport. Ever. The Beckham-era Galaxy jersey, love it or hate it, works. So why does the 2012 version radically depart from it? We’ve heard the “MLS to Miami” story before, and we’ve heard the “Beckham gets a team” story before. But with the new deal between David Beckham and the LA Galaxy inked last week, Britain’s Daily Star “exclusively” reports that his getting to helm an MLS team was the sweetener in the two-year deal and that Beckham’s choice is Miami, citing a senior AEG source. Thursday Happy Hour: What’s a Happy Hour Without Beer? David Testo is one of 21 nominess to fill 18 spots on U.S. Soccer’s Athlete Council. Notable members currently serving on the panel include LA Galaxy’s Landon Donovan, DC United coach Ben Olsen, and the Boston Breakers’ Cat Whitehill. Testo spoke to Outsports about the nomination, so check out their post for his comments on accepting the nod.